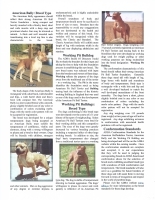 Breed Reclassification Process Underway: American Staffordshire Terrier - American Bully - Working Pit Bulldog. As a continuation of my article in the last issue of the Gazette, What In Your Pedigree? I hope to give readers some of the details of the reassigning of dogs from certain bloodlines formerly registered as American Pit Bull Terriers into breed reclassifications that more distinctly defines their breed type. The registration department has painstakingly done the research on the registrations of dogs currently being processed using photos submitted and online to understand the type of dogs that certain kennels and bloodlines are producing. A dog’s registration with another kennel club as a breed other than the American Pit Bull Terrier also qualifies a dogs in moving to that breed classification with the American Dog Breeders Association. The breed names for the dogs being moved from the American Pit Bull Terrier stud book to another breed classification include American Staffordshire Terrier, American Bully and the Working Pit Bulldog. American Staffordshire Terrier: Breed Type The American Kennel Club opened their stud book in 1936 to select UKC and ADBA registered American Pit Bull Terriers due to the popularity of the dog Petey of ‘My Gang Comedy’ fame. The breed name was changed, at that time, to American Staffordshire Terrier for the dogs admitted into the AKC stud book. The history shows that no other breeds have been in fluxed into the development of these dogs. 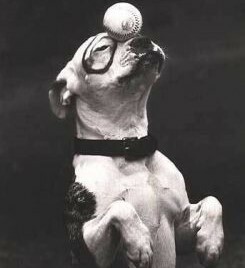 Fanciers developed a standard for their dogs and the breeding goal of many of the breeders was for the look of the dog, not the heritage purpose as an athletic fighting dog. Any new single registrations of AKC registered American Staffordshire Terriers will be registered as American Staffordshire Terriers with the ADBA. Any current ADBA registered dogs with 75% or more of AKC registered American Staffordshire Terriers within their ancestry and exhibiting American Staffordshire Terrier breed type can elect to have their dog recognized under the breed name American Staffordshire Terrier. American Bully: Breed Type The American Bully appearance should reflect their strong American Pit Bull Terrier foundation – being compact and heavily muscled with a blocky head, short and wide muzzle with a deep stop and prominent cheeks. Ears may be trimmed or natural. A thick and well muscled neck transitioning into a level top line is also characteristic to the breed. Bull Terrier origins. Dogs weighing over 75 pounds currently registered as American Pit Bull Terriers and tracing back to the bloodlines that were developed as working dogs used for weight pulling or other working purposes are being reclassified into the breed designation Working Pit Bulldog. The conformation characteristics of this breed should reflect their strong American Pit Bull Terrier foundation. Generally these dogs stand tall with length of leg, large bones with health and soundness of body and temperament. Body type is rectangular with a wide loin and hip and a well developed backend to match the well developed musculature of the front assembly. The dogs have a short, glossy slightly bristled coat in any color or any combination of colors excluding the merle color pattern. Dogs with the merle color pattern will not be accepted for registration. Any dog weighing over 135 pounds (lean weight) at two years of age will not be registered. Any dogs exhibiting extremes in conformation with associated health problems will not be registered. 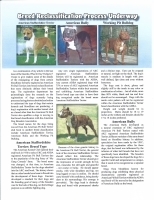 Conformation Standards ADBA Conformation Standards for the American Staffordshire Terrier, American Bully and the Working Pit Bulldog are being developed and will be on the ADBA website within the coming months. Once the conformation standards are complete and accepted, it is our expectations that they will be used in judging the corresponding breeds in ADBA Sanctioned conformation shows for the selection of brood stock exhibiting excellent breed type with soundness of both conformation and temperament. The breed standards will also serve as a guideline for future breeders of these dogs and will assist them in moving forward in terms of recognition and respect in the world of purebred dogs. Please visit the ADBA webiste www. adba.cc for more information as the breed standards for these dogs develop. ​​ L​​uceny's Peter was Petie's American Kennel Club registered name. His UKC name was "Perple Ribbon Peter" Petie was whelped September 6th, 1929. He was Bred by A.A. Keller, and owned/trained by Harry Lucenay. 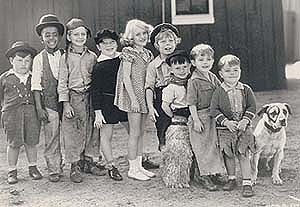 He was one of several dogs to star as "Petie" in the "Our Gang " series and one of the first "Pit Bull Terriers" to be registered as an American Staffordshire Terrier by the AKC. Can I Reclassify My APBT to the American Bully Breed? Breeding AMSTAFF to APBT or American Bully is no Longer Accepted. APBTs and Workiing Pit Bull Dogs can Produce Either Desired Breed, APBT or Working Pit Bull Dog. American Bully History: What Caused the Reclassification and Need for Bully Breed? 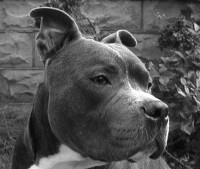 Pit Bulls Against Misinformation Petition A.D.B.A. Update: The ADBA has responded and we thank them! 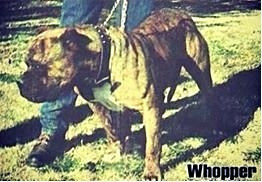 There has been massive media attention given to "The Hulk" a 173+ lb mixed breed dog marketed by his breeders Dark Dynasty K9 as an American Pit Bull Terrier. A dog they claim publicly is dual registered as an APBT by both the UKC and ADBA. The breeders have Hulk's pedigree posted on line which shows Whopper as an ancestor. 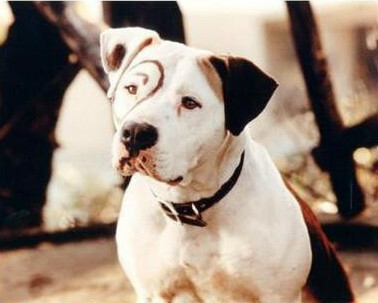 It's been well known for many years that Whopper dogs are not American Pit Bull Terriers and claims have been made that Eddington mixing his Freeman bloodline to produce Whopper was done with full consent and knowledge of both the ADBA and the UKC to create behemoth dogs who excel in weight pull events. Because of this, unethical breeders such as DDK are able to pass off their obviously mixed breed dogs as APBT (Pit Bulls) and dupe the uneducated public into believing these dogs are representative of what the American Pit Bull Terrier is. The Hulk has gone viral as being the world's largest APBT but those familiar with the breed and his pedigree know for a fact that he is not a Pit Bull. In effect, if Whopper is continued to be allowed to be registered as a Pit Bull with UKC and ADBA, irresponsible breeders - the very breeders we should all be united in shutting down to ensure the betterment and preservation of our beloved breeds and to help reduce shelter dog intakes, will continue to benefit from an error in your stud books that should have been corrected years ago. Breed mislabeling, as you are well aware, leads to the passage of Breed Specific Legislation - laws which both of your organizations claim to be against. Both of your organizations also claim to support responsible breeding and there is nothing responsible or ethical about charging thousands of dollars for dogs of misrepresented lineage. Because of these very points, both of your organizations have a very clear duty to right this wrong by immediately revoking Whopper's registration and by ensuring that The Hulk is denied registration as an American Pit Bull Terrier. If it is true that The Hulk is registered with either of your groups (as DDK claims on their website), those papers should also be revoked to ensure that he, and other dogs like him, are not able to gain recognition for a breed they are not. 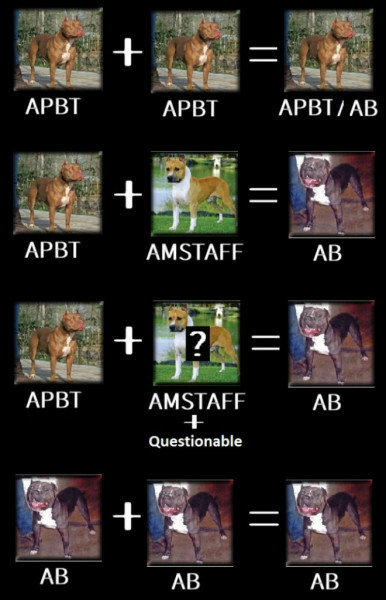 "At this time, ADBA has started the process to investigate and identify the issues in our APBT stud book. There are current high profile problems that need to be addressed immediately; ADBA will take action. We are also currently contacting individuals that may have direct knowledge regarding Eddington’s A/A Wanna Be a Whopper. " "The United Kennel Club, Inc. welcomes a new breed, the American Bully, to its list of recognized breeds, effective July 15, 2013." Kalamazoo, MI. July 15, 2013. "Dogs from bloodlines known for producing dogs exhibiting these physical characteristic currently registered as American Pit Bull Terriers within the ADBA stud book will be moved to the designation of American Bully as the breed"
Kalamazoo, MI. October 1, 2013. "On July 15, the United Kennel Club, Inc. welcomed a new breed, the American Bully, to its list of recognized breeds. Initially, based on several factors, it was assigned to the Terrier Group. Upon further research and at the suggestion of many of the breed’s fanciers, UKC has decided to move the American Bully breed to the Companion Dog Group, effective October 1, 2013." 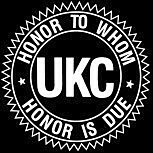 "The foundation process has been established by UKC in their acceptance of the breed as of July 15, 2013. These dogs that fit the American Bully breed type will be required to have their ADBA registration changed to that breed. However, the ADBA will not register any dog that has any conditions or exaggerations that are detrimental to the health, soundness and the general welfare of the American Bully or any other breed." United Kennel Club Taking Action: Suspended/Barred & Notified!